Inder Loves Folk Art: Flip that vest. I hope all of you that celebrate Thanksgiving had a wonderful holiday! We hosted family Thanksgiving this year, so our house was (literally) packed with people and food. The fridge is so stuffed full right now that I am afraid to open it! Well, I'm back in business. Sort of. My sister kindly loaned me her sewing machine, an older (probably 80s) model Singer. I oiled it, adjusted the tension, cleaned around the bobbin case, and put a new needle in it. It sews well! As long as you don't make it do anything too challenging. 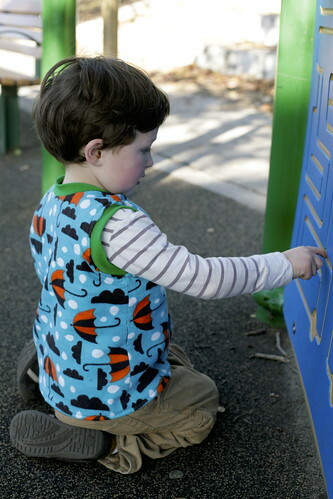 Or, more specifically, don't ask it to make the "Flip Vest": Dana's fantastic reversible vest pattern. Which is naturally, the very first thing I tried to do with it. Oh well, if I only post slightly out of focus and/or distance shots, you won't be able to see how sloppy and bubbly the topstitching looks, right? And luckily the soft fabrics make it less noticeable. It's that time of year again. 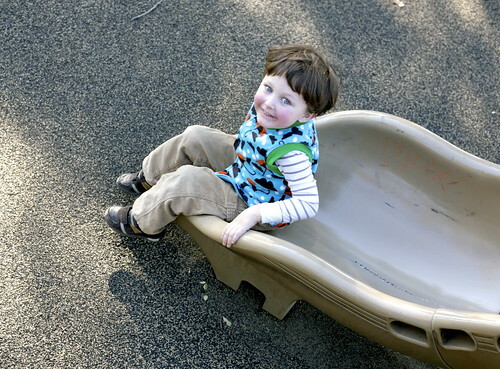 Joe needs some warm layers to wear at the playground, but like many boys his age, he tends to resist outerwear that impedes his movement in any way, e.g., coats and jackets. 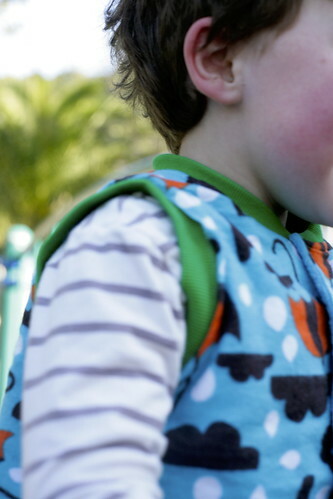 This vest is the perfect way to add a layer of warmth without restricting play (it can go over a sweatshirt or under a jacket, too), and the velcro closures make it easy for a kid to take on and off himself. The "outside" of this vest is actually a lovely turquoise fleece. But when Joe saw the vest, he absolutely insisted on wearing it with the flannel "lining" showing and wouldn't even try it the other way! Luckily it's reversible. Myself, I prefer the plainer look of the outside, but Joe's enthusiasm for this super loud umbrella flannel (purchased at JoAnn's) is pretty infectious. It probably won't come as a shock to my loyal readers that I am not much interested in shopping on the the "biggest shopping day of the year," a.k.a. "Black Friday." Shudder. I know some people love the ritual, but me, I hate traffic, and crowds, and lines, and Christmas carols piped in through big speakers, and yeah ... not for me. 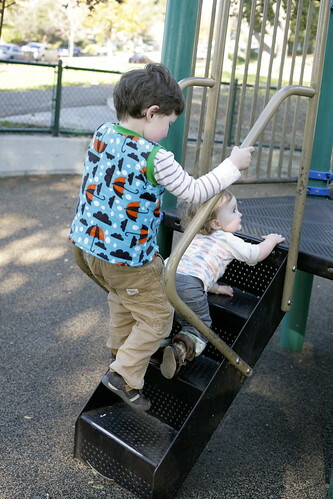 But it was a lovely clear day, so the kids and I walked down to our local park, which is a little urban and gritty, to be sure (this is Oakland), but has a great fenced in playground for the little kids. Joe and Maggie, who has finally recovered from coxsackie (except a little runny nose), had fun running around, climbing, and shrieking. Fresh air is good for kids on the mend, and the park was vacant so I didn't feel too bad about bringing contagion with us. "Baby Snotface" a.k.a. Maggie. Poor bub! But she's the cutest, even with a crusty drippy nose. Her t-shirt was given to her by Jane, who blogs at Lempo Bee, when she was just a wee Snotface. 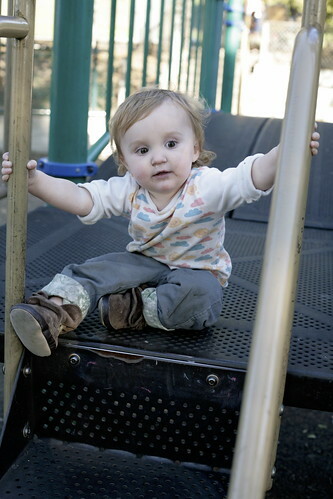 This shirt is a magical garment - it has fit Maggie since she was about 5 months old, and continues to fit great at 16 months. I expect it will last us a few more years, minimum. 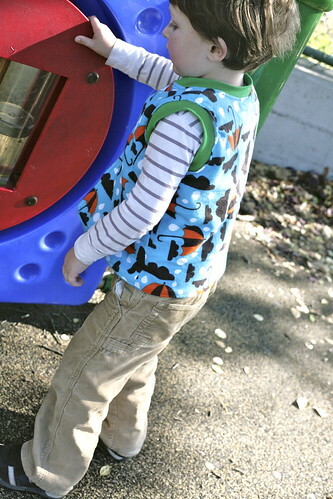 Despite my sewing machine woes, I loved sewing the Flip Vest. It's super easy, but the ribbing at the neck and sleeves gives it a little extra polish and endless opportunities for fun fabric/color combinations. Like I needed any more reasons to collect knit ribbing in all the colors, right? Maggie is definitely getting one of these as well, but I'm going to wait until my sewing machine gets back from the shop. This would make a really fast, easy, and fantastic gift for a baby or toddler in your life. There isn't any fitting required, it is simple to make, and the end result is both fun and useful. The pattern only goes up to size 5, but would be very easy to extend several sizes beyond that. Joe is long-torsoed, so I probably should have added a hair more length even to the size 5.
inder, i give you so much credit. girl, you've got grit. i love that you made this work. you are a rockstar! also i wanted to agree with Rachel that thanksgiving at your place would be perfection! We don't 'do' Thanksgiving but even fish and chips with you guys would be awesome! I hope you get your machine back soon. I always feel naked when i don't have mine.